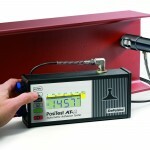 Measuring the adhesion strength of coatings such as paint, glue, varnish etc. is necessary to ensure the coating has bonded well to the substrate and is performing satisfactory. A variety of adhesion testing methods are available to determine how well the coating is bonding to the solid such as metal, wood, concrete and other rigid substrates. 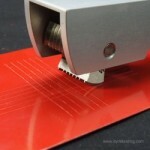 This method is simple to use and gives a definitive adhesion value. Tensile dollies are glued to the coating and when the adhesive has cured, the force required to pull the coating off the surface is measured. The Automatic Pull Off Adhesion Test instrument will measure the tensile pull on a dolly glued to the coating surface and can be used on a variety of flat, uneven, curved (convex or concave) surfaces. This method is widely used to assess the adhesion of paint coatings and provides an instant assessment of the quality of the bond to the substrate. The cross hatch test is a visual comparison method for paint and powder coatings up to a thickness of 250µm which is fast and easy to use. The coating is cut into small squares, thereby reducing lateral bonding, and the coating adhesion assessed against ISO, ASTM or Corporate Standards. Click on one of the links below to read about the products we can offer you.